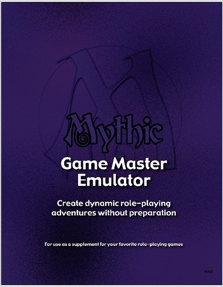 Mythic Game Master Emulator (GME) began life as a part of the Mythic RPG. It was created as a way for either solo play or as a way for a GM to run a game without a planned adventure. After it became popular Mythic GME was released as a separate system that could be used with any RPG. The way the GME works is by asking yes and no questions, determine the odds for the answer, then rolling on the fate chart for your answer. An example say you are chasing a bad guy through an alley and come to a building. You ask the question, "Is he in the building?" You go to the Fate chart and determine the odds. The odds go from impossible to 50/50 to has to be and with everything in between. Once you pick the odds you feel is best you roll a D100. If you roll within the percentage of the odds you picked the answer is yes. If you rolled higher than what the percentage is then your answer is a yes, the higher you roll the bigger the yes. A police officer is shooting at a bad guy. He has a clean shot and is pretty close so you think he has a good chance of hitting the bad guy. You use the fate chart and find on it what his chances are for hitting him. If you think he can't miss you'd pick near 100, a 50/50 chance you'd of course pick 50 and if you think he has no chance you'd pick near 0. So you pick 50 and roll a 54, it's a hit and it slows him down but doesn't stop him. Same scenario and you roll a 76, a good hit and he falls to the ground obviously hurt. In the last scenario you roll a 98, the police officer nails him with a head shot with no chance he survived. This system works pretty well and after you get the hang of it, which won't take long, you'll be able to fly through it. When you roll on the fate chart and a double number comes up (11, 22, 33 etc) then it is possible a random event will pop up. If the first number you rolled (1 for 11, 2 for 22) is equal to or less than the chaos factor then a random event happens. When determining the random event you must keep three things in mind. The first is the context of the adventure so far. In the example before when you are chasing a bad guy and if alien ship suddenly landing in front of you wouldn't make much sense in the context of that adventure. The next thing to determine with a random event is focus. You roll on the Event Focus table to tell you what the event effects. Examples include something happening to an NPC, something to your player character or something to do with the story thread. The last thing to determine is Event meaning. You roll a D100 on the Event Meaning Action Table to generate a two word sentence that will help explain what has happened. I tried it out and rolled on both tables and my events were oppose energy which I would interpret as a new power plant is being built in my back yard and I'm not happy about it. The game works with scenes and as it sounds it's taken from movies. Your adventure is like a movie and each gaming session is one scene from the movie. Your goal is to complete the task of the scene and once that's done you can proceed to the next scene. When the scene ends you need to adjust the chaos factor. If the scene was a disaster and everything went wrong you would raise the chaos factor up 1. If everything went great you would lower the chaos factor by 1. The game has you write down each scene and a brief description of what happened in it. Also the game has you create lists for different things about each scene. Some of the lists are NPC's that you encounter, because they might come back later in your adventure. You also need to make a thread list. Threads are basically questions that come up during the course of the game. A thread is considered opened until you can satisfactorily answer it. An example is that you hear from someone that one of the cops is on the take and that thread stays opened until you find out if it's true or not. I've not used Mythic GME extensively but I've tried it in a few different RPGs and I have to say it works pretty well. It will never compete with playing with live people but it's a great way to be able to play by yourself and have what happens be a mystery to you. That's the hardest part about play RPG's by yourself. There are many war games that can be played by yourself and still be fun but it doesn't usually work with RPGs. This is a nice solution and if you are interested in playing RPGs by yourself I would recommend giving Mythic GME a try. It would also work well if you want to play an RPG as a character in stead of a dungeon master, GME can do that for you. I rate it an 8 out of 10.